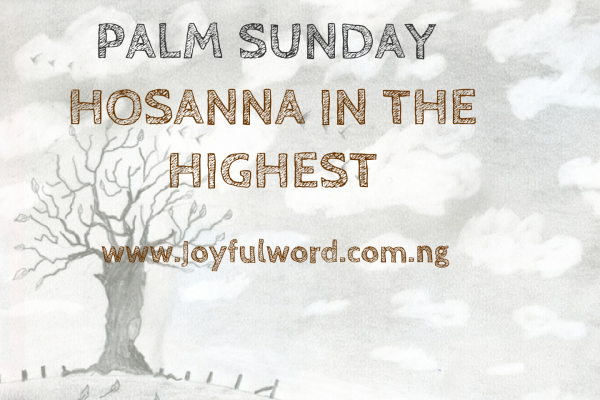 Today we celebrate the Palm Sunday of the Lord's passion. It marks the beginning of the Holy week. We are gradually coming to the day of the resurrection and today the Church presents us with the story of how Jesus triumphantly entered into Jerusalem as a king in order to fulfill his paschal mystery. It was Jesus' mission to die in order to save humanity and He never stopped until He fulfilled His mission on the cross of calvary. He is the obedient lamb who allowed His own creatures to torture Him and kill Him, in order for Him to liberate them. The celebration of the passion of our Lord is a reminder of what our Lord Jesus had to go through in order to save us and we must always try as much as we can to appreciate Him for that and then we make effort to become good and live a life worthy of our calling as His children redeemed by His precious blood. Jesus has taught us a lesson in obedience as we have in the second reading. He was in the form of God, but He emptied Himself and became obedient even unto death on a cross. The reward of His obedience came with the exaltation of His name above every other name. We must learn from Him to be obedient and keep doing God's will always because our reward will come in due time. Meditating on the liturgy of today we must go to calvary with Jesus with a new heart that is repented and be ready to suffer with Him on Good Friday in order to rise with Him on Easter Sunday. This Holy Week is a time to come closer to Jesus and carry the cross with Him, heal the wounds of betrayal, witness for Him without fear, reconcile with Him and our neighbour and resolve to live well and do good in His name. Good morning dearest one. SmileðŸ˜Šas you begin your day and do have a grace-filled Holy week. May Jesus lead you to Calvary where you shall experience total liberation and divine healing. Amen. *And May the Almighty God bless you: the Father and the Son and the Holy Spirit. Amen. Meditation: Luke 19:28-40/Isaiah 50:4-7/Psalm 22:8-9,17-20,23-24/Philippians 2:6-11/Luke 22:14-23:56 *Watch-Word:* Christ became obedient unto death, even death on a cross. If you die with Jesus, you will live with Him. Therefore, let us follow Him on His way to calvary with a repented heart so as to rise with Him on the resurrection morning.